Build a classifieds website like craigslist, my pleasure to promote our Classifieds Script. Open source classifieds is the very user-friendly site, each people can approach site easily with ease. We are providing quality products to our customers. Our developers are well trained to create a secured classified script in PHP. We have designed classified script like OLX,attractive features has Olx website. Our PHP Classified Script is the best place for the business development. Security is the most important thing for each and every product. Here we are used Two Factor Authentication is available in this project. Google+ Authentication also available in this product. The administrator can block the users, who are breaking our security rules of the site. The administrator has the rights to monitor all users’ logins and logouts. Our Classifieds Script is SEO friendly manner, customization meets very easy. As an admin the Classified Script Software can easily customize each and every part of the website. This site is responsive to view all accessories. The user can view all advertisements and their details with media, and they can share ad details via Social networks (Facebook, Google+, Twitter, Pinterest,etc.) The user can mark their favorite ads. By registering membership plan, user can post or view their advertisement. The user can upgrade their membership via PayPal, as user can view all categories of the advertisement. Those categories are in alphabetic order. In PHP Classifieds Script, it seems that Administrator will send importance news on the Classifieds Listing Software, latest updates and latest ads on our website.Administrator will control the membership plan. It is one of the main features in this website. The user can upgrade their membership via PayPal. PayPal online transaction is integrated into this website. Admin can view comments, recently published post and pages at a glance, and he can take quick notes using the quick draft. Membership plans and all content management system pages are managed by admin.In Classified Ads Script, admin can manage logo settings, favicon settings, layout settings, network connection settings and PayPal settings. The great advantage of PHP Classified Script Open Source is flexible to share advertisement via social Media. The reach will be as expected! 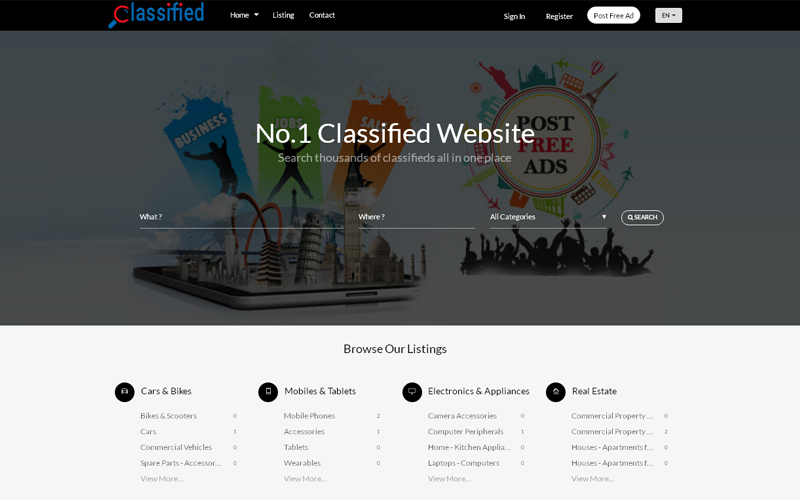 WordPress Classifieds Theme will help you to develop your business worldwide easily and faster. I started a good and successful business with this script which was affordable for me. I made my friends all to purchase this script and they are also successful enough. This script has responsive designs so that I started this business in my mobile itself which is more comfortable for me. If you are planning to start online classifieds website this is great opportunity to buy this excellent script for your website. Few months before only I purchased this script now I earned amazing revenue.